The 68-year-old victim was filling his car with gas Wednesday morning in Capitol Heights, Maryland, when he was shot. The gunman took the victim's car, police said. Jackson retired after working at Safeway for 30 years and is survived by a wife, three grown sons and grandchildren. A beloved grandfather and husband was shot and killed during a carjacking while pumping gas, Prince George’s County police said. Alonzo Jackson, 68, was filling his car with gas at a BP gas station in Capitol Heights about 7 a.m. Wednesday when he was approached by the masked gunman and shot. The shooter stole Jackson’s 2015 black Dodge Charger with D.C. license plate number DF0013. Police released surveillance of the alleged gunman. 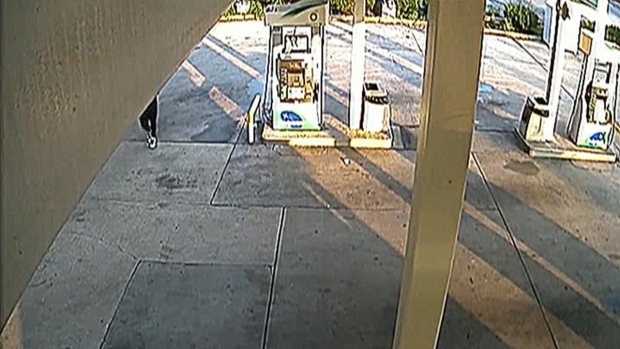 A man in Prince George's County, Maryland, was shot and killed at a gas station. News4's Chris Gordon reports. "We're asking for the public’s help in identifying him,” Lt. David Coleman said. “Obviously the suspect is armed and dangerous. We consider him a very serious threat. Call 911 if you see the car. Call 911 if you recognize him." Mary Shields, Jackson’s friend and neighbor in southeast D.C., said the car meant the world to him. "That was a prize,” she said. “That was like a gift to him for himself, because he thought back in the day he could not afford that car because he was not a college grad." Jackson lived his whole life in D.C. and retired after working at Safeway for 30 years. He is survived by a wife, three grown sons and grandchildren.